Inside the Putrajaya Station are simple to understand graphics. 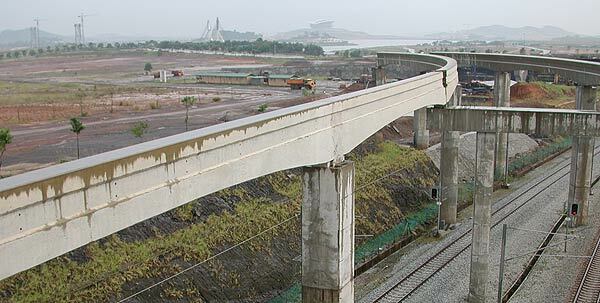 While the monorail symbol was already in place when these photos were taken in 2004, the system was still several years away from completion, due to the pause in construction. 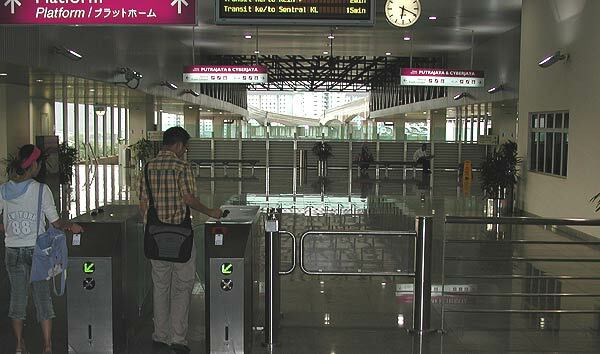 The station has been built for high capacity use of future years. If you look closely, you can see monorail track departing the station above this level. Hosting Ice and Pedersen was Kenneth Lew, Monorail Malaysia's Business Development Manager. 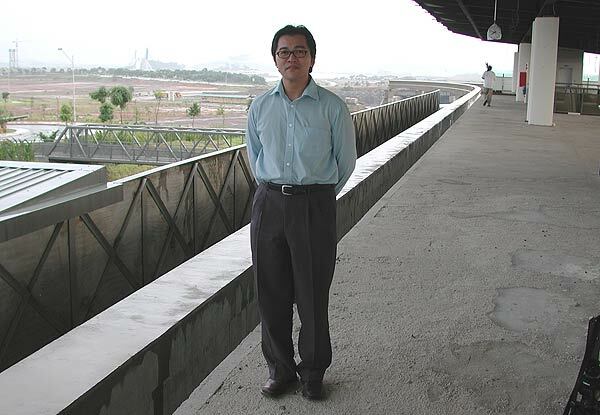 He's standing on the future platform for the monorail. The station is very long and certainly ready for whatever ridership requirements may be necessary in the future. 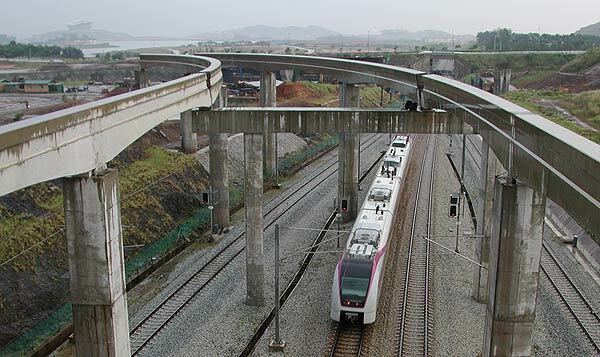 This first section of monorail guideway was built at the same time as the Kuala Lumpur Airport High Speed Rail line. Enough beamway was installed to avoid distruption of surface rail lines during later construction phases. On the station platform were various "ingredients" of monorail track. Another view of graceful arched Alweg monorail beams. Looking off in the distance, you can see two bridges to the main land mass of Putrajaya city. Furthest to the left is a bridge which is built exclusively for the monorail. Once complete, the monorail bridge will give riders a spectacular view of waterways as they approach the central city. Some sense of the large scale of this bridge is possible when you compare it to the green porta-potty in the foreground, and it's still a good distance from the bridge. This early art rendering of the bridge gives you an idea of how spectacular the Putrajaya Monorail will be. We hope to bring you more updates as construction photos come in from or friends in Malaysia! Return to Page One of the 8/13/05 Putrajaya pictures.